I started a FAE version of Mouse Guard covering character making, now lets move on to adopting other parts of this awarding-winning game. 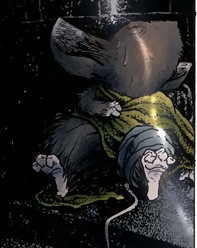 The damage system of Mouse Guard included descriptions of ailments that could affect the mouse’s stats. These are called Conditions and there are five: Hungry/Thirsty, Angry, Tired, Injured and Sick – they sound a lot like FATE Consequences. FAE characters measure condition with three Stress boxes and three Consequences. These equate to 18 pts. of Stress absorption. Let’s map the five Conditions over these Stress slots and we get: two Stress boxes 1  2, Hungry absorbs 2, Angry absorbs 2, Tired absorbs 2, Injured absorbs 4 and Sick absorbs 4. That’s only 17 Stress, but … they’re only mice. Recovering from Conditions is a lot easier than Consequences. However, they must be recovered in order: Hungry before Angry, Angry before Tired, etc. In other ways, they behave just like Consequences. For the minor Conditions – Hungry, Angry, Tired – it only takes a Fair +2 Overcome Approach roll to clear these when in a mouse settlement. For example, a Fair +2 Resourceful will find you vittles to clear Hungry/Thirsty. Other factors may influence these difficulties, of course. It’s harder to find food during Winter. It’s harder to get over your anger when you’re captured by the army of the Black Axe pretender. For the major Conditions – Injured and Tired – a Create Advantage Approach roll is needed to find a healer in a mouse settlement. The Healer’s skill is equal to your roll, then they roll a Great +4 Overcome to clear the Condition. If the healer fails, the Condition is still cleared, BUT you’ve taken a permanent ailment. Change your Picture Aspect to reflect it. 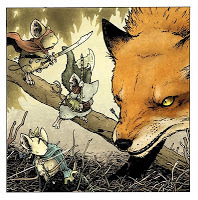 The narrative reins get swapped across the table in the Mouse Guard RPG. Let’s emulate this in our game as well. Sessions begin with the patrol party receiving a Mission from Gwendolyn, Matriarch of the Guard. The GM (Game Master as Gwendolyn Matriarch, GM as GM) lays out an assignment for them to undertake. Guard’s Mice trail blaze paths, deliver mail, hunt predators, solve other mouse territory problems and serve as ambassadors. Each player composes a unique Goal Aspect that reflects what they want to achieve during the Mission. Each Goal should be different from all the others and reflect the character of the mouse you’re playing. Lieam’s Goal in the first issue Learn all I can from Saxon and Kenzie. Saxon’s Goal for the same issue Root Out and Dispatch Traitors! After the mission is assigned and the PC’s leave Lockhaven, its the GM’s Turn. She arranges three to four Challenges, Contests or Conflicts in the patrol’s path. Each one deals with confronting the weather, animals, the wilderness or other mice. Keep’em varied and keep’em guessing. 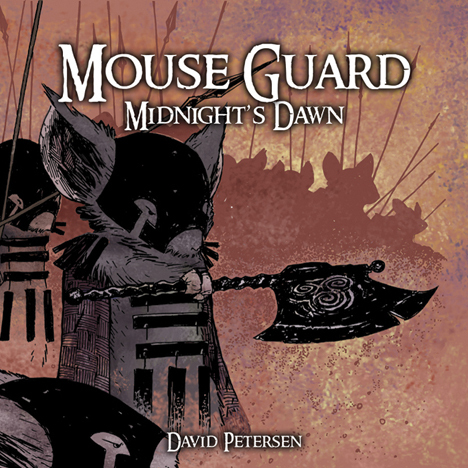 Guard’s Mice aren’t heroes because they wear cloaks and carry weapons, they’re heroes because they get beaten up for the greater good! After these encounters, the patrol happens upon a settlement or relatively safe place. Now the Player’s Turn begins. Each player gets one scene to either Recover from a Condition or Make Progress in the Mission. Either kind of scene allows one roll by the PC whose scene it is, but teammates can help them with teamwork. Players must spend a FATE pt. for an extra scene of either type, but may not have two of their scenes in a row. When all the scenes are done, back to the GM Turn! After one GM Turn and one Player Turn, you could call the session over. This makes each session about comic book length. Then again, you could be doing a graphic novel? Repeat turns until real life intervenes.